Summer, 2019: Mondays, 7:30 pm. 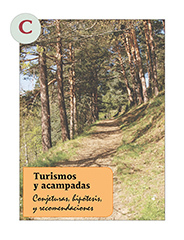 In Intermediate C, you will learn to talk about vacations, traveling and camping. If so inclined, you may also talk about your favorite adventure sports. You will also learn to give polite advice and recommendations to your friends or clients telling them what you would do... if you were in their place. In short: In addition, to learn to use your Spanish to persuade, you will learn to talk about the possible... although it may not be real. In a brief loop, you will learn to nag!! Important and useful communication skills indeed! You will also learn to tell us what people advised you to do in the past and how to remind people what you advised them to do. You will learn about Argentinian culture about the mate and the chamamé and you will watch a movie set in the pampas about three people engaged in a road story to find themselves and their destiny. The movie is Historias mínimas (2002) by the director Carlos Sorin and it is a short little gem.